Me on my first lap ever at Council Bluff Lake. Changing one of about 5 flats. Photo by Stephen Venters. My first time at Burnin at the Bluff in 2010, I couldn't finish a lap faster than 2 hours. Multiple pinch flats and a serious lack of bike-handling talent humbled me on the 12.5-mile singletrack loop of Council Bluff Lake. Luckily I had saints (Todd Holtmann and John Peiffer) for teammates and they forgave my inexperience by throwing down some much faster lap times and we finished 4th coed team that year. Me and Wendy at Burnin 2012. I was barely sober enough to climb the podium. I wasn't able to race in 2011, but in 2012 I woman-ed up on Friday night and jumped into the 12hr solo category against Wendy Davis. My fastest lap that year was a 1:39, but I was able to eek out the victory with 5 laps after building a 15ish minute lead. I distinctly remember slowly walking up one of the punchier climbs on the route, eating peanut butter crackers and wanting to cry. When I was able to finish with 5 laps, my body was wrecked and I attempted to fix it with Wild Turkey American Honey...not recommended! Bootlegger's Burnin 2013. Photo by Sneat Pinkles. I also wasn't able to race in 2013 because of some adventure racing conflict. That turned out to be okay since Council Bluff Lake is part of Mark Twain National Forest which was closed for the government shut-down. 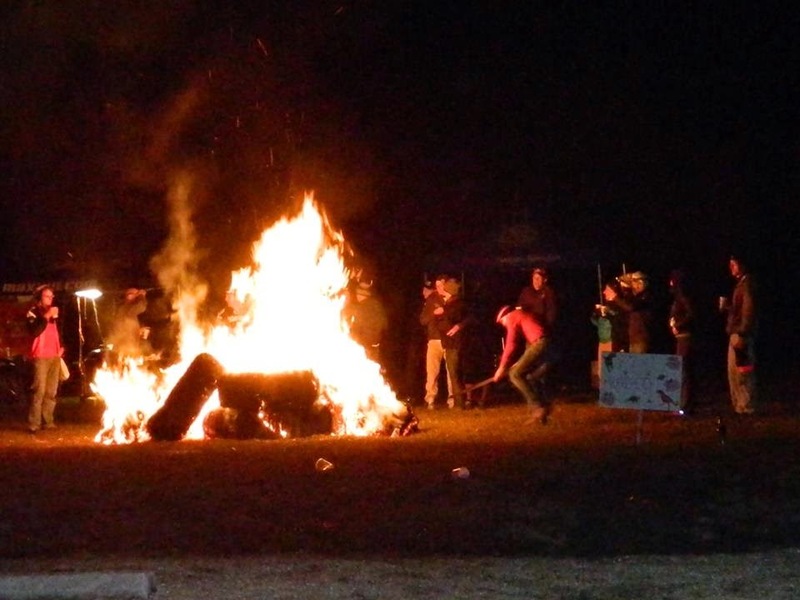 Bootlegger's Burnin was still held, but not as many people showed and they all thought emptying kegs of PBR was more important than churning out laps of CBL. They were only being polite - it's rude to expect someone to haul full kegs back to STL. 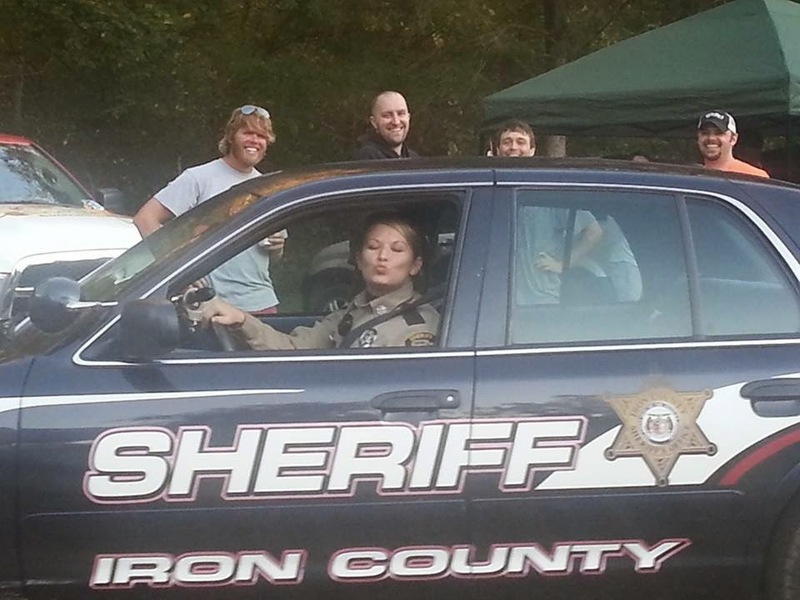 Just your friendly neighborhood mountain bikers trying to make everyone's weekend a little easier. OT100MTB podium. Photo by Melisa Link. 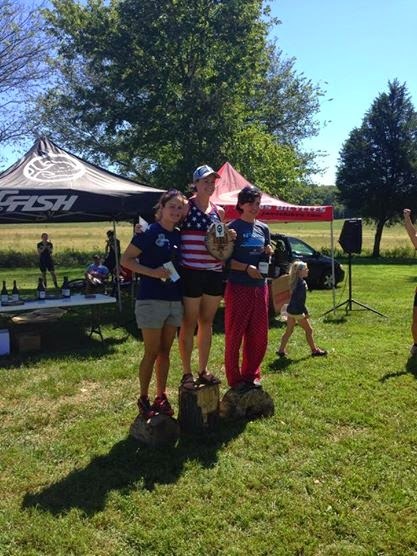 And that brings us to 2014, the year of the inaugural OT100MTB where Kate Wilson beat me so convincingly in the 100-mile women's race that I didn't even want to toe the line at Burnin and potentially lose again. I was one text message away from joining an all-women's team and only being responsible for 3 speedy laps instead of more-than-3 steady laps. But after talking to my Team Noah Foundation teammates, I realized I couldn't just slink away from one tough loss. I had to re-evaluate my race logistics, strategy, and most importantly, mental focus. It's not like I made any huge mistakes at OT100MTB, but after carefully dissecting every mile of my ride, I found a few things that I could improve on to help Burnin go well. Starting line of Burnin 2014. Photo by Patrick Kirkes. So I showed up at Council Bluff Lake on Saturday morning with a plan. Execute my race, smart and steady, and be ready to go to the well when the race demanded it. 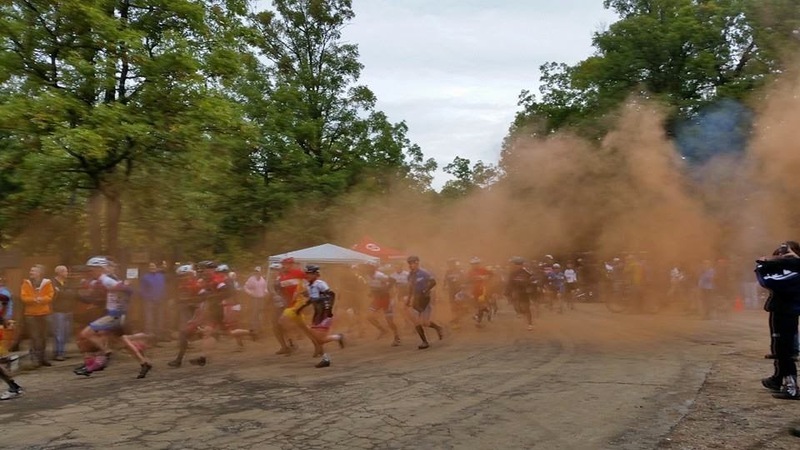 And I did plan on digging deep - I had raced for 29 hours the weekend prior at USARA Adventure Racing Nationals, finishing 5th overall with my Alpine Shop teammates Jeff and David. But I had taken it extremely easy the days in between and I knew that if I kept my brain in the right place, my legs would show up with an honest effort. I set up my pit beneath a glorious Alpine Shop pop-up tent and got the SegSlayer all ready to go. The morning was cool but not freezing and no rain - perfect racing conditions. I had heard reports that the singletrack was in terrific shape despite constant rains on Friday and I couldn't wait to get on it myself. We all lined up for the long Le Mans start and I landed on the front row. I have no idea why. It's not like I planned on or even WANTED to be at the front of the race. But David and Peat and Dwayne were there so I just stood like I belonged. We sang the national anthem, lit some smoke bombs, and then took off for the run to our bikes. Did someone have chili for breakfast? Photo by Kelly Skinner. Clackity-clack-clack-clackity-clack! That is the sound of getting passed by more than half the field at Burnin, and I am not bothered in the least. I don't want the pressure of people riding close behind me on the singletrack, so I just jog, find my bike which is exactly where I left it (not always the case at Burnin), jump on, and ride off down the hill. I note that Kate is ahead of me but she soon zooms out of my field of vision and I let her go. I've been really nervous all morning and now that the race has started, I can't shake the tension like I normally do. And I handle my bike like crap when I'm nervous. This isn't good. I know I just need to get a few miles under my belt so I try not to beat myself up too badly when I put a foot down in the easy sections. I finally make it to the campground climb that signals the end of each lap, and happily spin up it to find out my fate...how far ahead is Kate? As I ride through the pit area, I get reports from various people, ranging from 1 to 10 minutes. Not very helpful. But thankfully Carrie is there under the Alpine Shop tent, ready to help me with my stuff and with a reliable split - 3 minutes from when Kate left. I just grab some extra calories for my bento and ride out for Lap 2. I am encouraged that despite my shaky bike handling, the gap up to Kate isn’t disastrous. Back on the trail, I focus on how lucky I am to be riding one of my all-time favorite pieces of singletrack in nearly perfect conditions. And, I get to do this ALL DAY!! I think about my journey from total newbie to somewhat accomplished racer, and try to remind myself that no matter what happens at the end of 12 hours, I’ve come so far already. One of the many things that Team Noah Foundation has helped me focus on is the journey. Results are good but our evolution as people and as a community is what we’re all here for. I reflect on the many teammates I’ve raced with both mountain biking and adventure racing, how much I’ve learned from them, and how much their teaching fills me with gratitude and joy. I know this sounds incredibly sappy but it really was my mental state on Lap 2. Just before I get to the rock garden (near mile 8.5 out of 12.5), Heather (racing 6hr solo) catches up to me and we both clean the rock garden (victory!!!) and onto the dam. Heather hustles by and for a minute I just let her go. And then I remember how good of a technical rider she is and how much I could gain by following her wheel. So I sprint back up to her and am rewarded with 4 miles of fast, clean riding. Her pace is just one tick above mine, but her lines are immaculate and by following them, we absolutely fly through the remaining singletrack. We climb up the the campground together and once we get to the top, I tell Heather thanks as she stops at her pit. I also see Kate just leaving her pit so I know the gap is down to a minute or so. Great news! Top of the campground climb on Lap 1. Photo by John Gomes. I ditch my vest, change into lighter gloves, and swap bottles before heading out on Lap 3. The previous lap helped me find my singletrack swagga and now I know that Kate is within reach. But we still have many laps ahead of us and I am in no rush to catch her as long as the gap stays manageable. Finally, just after the rock garden, I catch sight of her crossing the dam and am encouraged. I see no benefit to passing her now so I just ride 10-60 seconds back for the remaining 4 miles. I think I get close enough a few times that she figured out I was there, but not sure. In any case, it doesn't really matter since my left groin muscle cramps as we climb up to the campground. No bueno! I'm discouraged but not devastated, again this is still early in the day and I have plenty of time to fix this. I take it super easy on my legs and am able to get some encouragement from speedy Nad Snurb as he passes me on the right-hander switchback. Go 1993 Bulls! Once in the pit, I am focused on getting some salt. I double up on nuun tablets in my bottle and get some e-caps from Tara who set up her tent next to mine. Saved, thanks lady!! Fully restocked on nutrition, I roll out with a turkey sandwich in hand and a goal to fix these cramps ASAP before the race gets serious. Ironically, I purchased "low-sodium" turkey for my sandwich and am laughing at myself for that "healthy" decision. Anyway, I eat the entire thing before hitting the singletrack and then it's pure bliss once again. Gino catches me early and I give him a quick recap of the race so far before he zooms past. Strove Frodeman does it a few minutes later. I swear, these fast guys doing single laps seem like fighter jets compared to my 12hr pace. It's actually really inspiring to me and I try to visualize myself floating over the babyheads and shredding through the loose turns like they do. Zoom zoom! I catch back up to Kate at the rock garden (seems to be a theme here) but again don't want to try to pass her until I'm sure that my legs are good to go. So we ride loosely together for the rest of the lap until the start of the campground climb. Kate has gotten a little bit ahead of me and as I ride up, I notice she's standing still, off her bike, and a curious pssssssssst noise is coming from one of the tires. Oh no! A flat! I stop and offer to help but Kate says she has everything she needs. I don't need to be told twice to keep riding. But my "sprint" uphill is really comical since I still haven't quite fixed the cramping in my legs yet. So it's more like a slow-motion spin into the campground. I circle the field just as Aaro the announcer is calling time on the 6hr race and I am super-stoked to finish my 4 laps in 6hrs flat. 2 years ago it was my "stretch" goal to reel off four 1:30 laps in a row and now I've done it as a part of a much bigger race. This fills me with confidence as I execute another quick pit with the help of Maria and hit the road for another lap. I didn't anticipate being in the lead of the women's 12hr race on Lap 5, but these are the cards the race is currently dealing, and I know I have to double down my effort here to have any hope later of staying in front. I was leading the women's race at OT100MTB until mile 87 and lost it because I wasn't riding as smart as I possibly could. So now I try to take all of the lessons I learned from that day and put them to use. Climb hard, but not too hard. Ride clean through the every tiny tech section that I possibly can. And on the downhills, RECOVER instead of push. I chat this out loud to myself everytime the trail turns down. Hands loose, shoulders loose, legs loose, deep breaths. Heart full, eyes clear...or something like that. Actually my mental soundtrack was rockin all day thanks to Bronze Radio Return's Further On and Up, On & Over. Seriously, this band is so inspiring, check them out. Adding to the party in my brain is Dwayne and Peat who have finally lapped me, guess where, just before the rock garden!! I am pretty pumped to hold them off for 50+ miles, and they have news that Kate has successfully fixed her tire and is riding again. Woohoo! 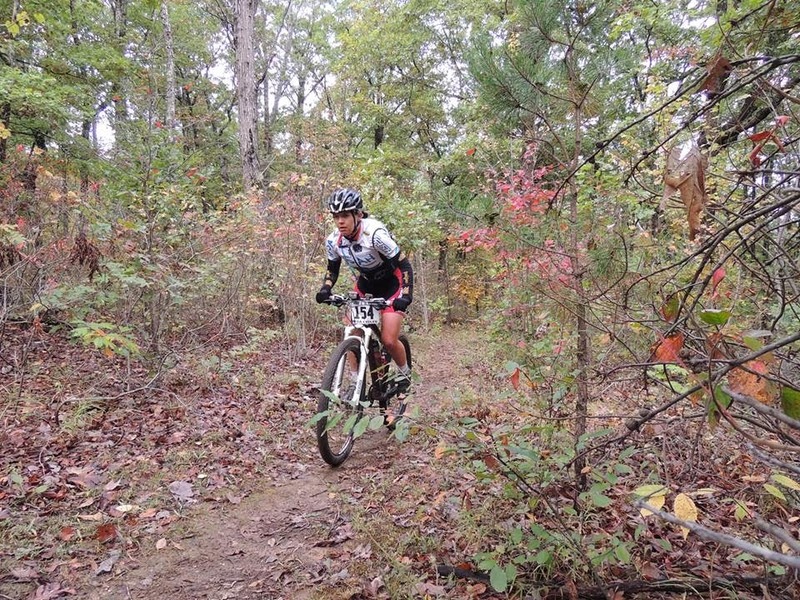 As I spin up the campground climb my legs seem to hold strong and Maria and Jeff help me in the pit. As I ride off on Lap 6, I can't help but compare my mental and physical state from 2012. That year, I was completely crushed by 5 laps and couldn't imagine a sixth, let alone the SEVEN that Jen Goldstein rode to win the women's 12hr. Now, I'm still feeling reasonably strong, although my hands have started to go numb. I have a love/hate relationship with hand numbness. First, I like it because it means I've been riding a long time. Then, I dislike it because it hurts. Then, I like it because it means I brake less so I go "faster". Then, I dislike it because I get scared about braking less. Then, I like it because it forces me out of my comfort zone. So. There you have it. A peek into EK's racebrain. Oh yeah, and the real EK passes me just before the paved boat launch with surprising news that the 1993 Bulls are not living up to their destiny. And that's really all I can remember about Lap 6, just trying to stay strong but not too strong, take a few glances backward but not too many because "winning is that way". I make it back to the pit around 6:00pm with the sun slowly setting so it's time to add lights to my bike and helmet. I felt like this took me a long time to deal with at OT100MTB so today I've prepped a second helmet with a Stella 300, and my Seca 750 is already on my bars, I just have to plug in a battery and I'm off! Maria helps me again with a quick pit and soon the dusk is settling over Council Bluff Lake. On the doubletrack leading into Enough Boat Ramp I start to turn on lights, and it takes me a few miles to get used to the transition. I crash pretty hard on one of the uphills just after Enough, and land on the downhill side of the trail with my bike on top of me. I feel panic rising in my heart, fearing that Kate will catch me while I'm tangled up on the side of the trail. I try to calm myself down and get going again, which is hard but I manage. I'm alternating between moments of joy and moments of despair. I remind myself to keep digging deep to make up for the apathy I battled (or rather...didn't battle) at OT100MTB. Throughout the rest of the lap, several lights catch me and for each one, I'm praying that the voice behind it is male. Lucky enough for me, they all are, including a repeat visit from Gino who tells me I sound much happier than earlier in the race. And he's right! It's hard to keep track of landmarks from earlier in the day, but the sharp right-hand turn that signals the start of the campground climb is hard to miss. All the way up hill I'm doing mental math...do I have time for another lap? Does Kate? Once at the top, I check in with the timing tent to see if they have any idea what the gap is back to Kate. They say it's around 10-15 minutes, but then I realize I have no idea how much time I gave up crashing. Anything can happen here at Burnin and I'm in a tough spot. All laps have to be completed by 9:30pm or they don't count. It's 7:45pm and if I have to do another lap, it will take a near-perfect ride to finish before the cutoff. I would really, really rather not ride it if I don't have to. So, I prepare for an 8th lap at the Alpine Shop tent, drinking an Ensure and filling my bottle with Coke, while Maria stands guard at the singletrack exit to see if Kate is close behind. The clock ticks down, each second inching closer to being done. Finally, with only 1h25m remaining, we haven't seen Kate, so I walk back over to the timing tent to tell them I'm done. If you don't crash at least once, you're not riding hard enough. Photo by The Claw. They congratulate me unofficially on the win and then point out that my left knee is bleeding! I hadn't even realized it. Struckman digs out his first aid kit and The Claw hands me a delicious pumpkin beer as we work on cleaning out my disgusting wound. Fortunately, it's not terribly deep, just bloody, so I eventually just pack it with iodine swabs, slap a bandaid on it, and call it good. I have a few minutes to change into dry clothes and even have a beer before the awards ceremony! It's awesome to see the final riders come through, and to see Peat and Dwayne ride to the finish together after their 9-lap odyssey. Peat takes the win with a wheelie across the line in true Peat fashion. 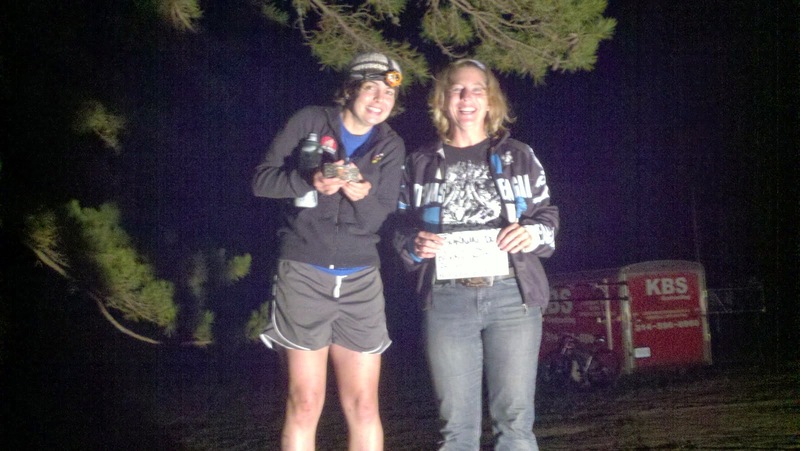 So I can't find a picture of the 12hr women's podium, but it was me and Kate rockin the straw bales! Photo credit secret to protect the innocent. And then, against all advice from The Voice Of Reason, we burned said straw bales. Maybe Scooter and I found some boxes to throw on the bonfire as well. We were just trying to be helpful - burning boxes is lot easier than hauling them to the dumpster. Maybe a flamingo or two was included in there too, but I can't say for certain. Once the fire had died (or had it?) we migrated to Campsite C and proceeded to demolish their buffet of perfectly charred corn, and potatoes, and red pepper hummus. Oh my, it was delicious. Just ask Carrie. And then, with a rather quiet, tame, and strangely coherent walk back to my campsite, Burnin was over. The road leading into this race was hard for me. 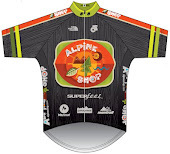 I needed to lean on the strength of my Team Noah Foundation and Alpine Shop teammates for the courage to even sign up, and for the skills and mental focus needed to have my best race. And, in a way that maybe only makes sense to me, I needed Kate to win the OT100MTB so I could have the day I had at Burnin. A few days after the race, both she and Peat thought that I had broken the women's 12hr solo record, and it was Kate who dug up the evidence on the Interwebz. Turns out we both smashed Jen's previous best of 7 laps in 12:36 (Kate in 11:15 and me in 10:53). Now records in mountain biking are a little silly because they are so dependent on trail conditions, but I am still so proud of what we both accomplished at Burnin 2014. Dwayne is always about the journey and I can tell you that laps around Council Bluff Lake is one of the best journeys you can ever hope to take. HA! With your "jog" you were way ahead of my"run". Nicely done! It would have been funnier had you accidentally typed that you, after your last lap, filled your "nose" with coke. har har. Way to crush it out, and finish a race like this with superior form, fitness,and mental preparedness. Making the rest of us look bad! maybe if i had filled my nose with coke i could have done a 1:25 night lap! zzzzzzzzzzing! it should be noted that when i realized i didn't have to go out again, i added ice and Captain to that water bottle with Coke in it. it was not wasted! ugh. 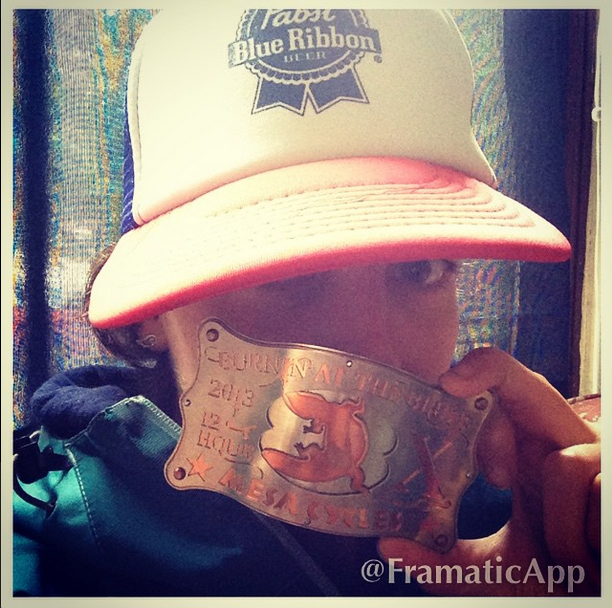 that buckle... what a tease :) Totally earned, and a freakin' awesome race! I'm pretty sure my knee was only bloodier 'cause I smashed it lap 3 (doh). Way to keep pushing - I'm (not so secretly) glad we (ok, just I) could only manage 7 laps with the time cutoff this year! sorry about the awards mix-up. that was awkward. we will be on a mission for 8 laps next year fo sho!